There wasn’t a new episode of The Orville this week. However, for your weekend pleasure, we present some deleted scenes from The Orville, behind the scenes tidbits, and more. We’d seen puppets teased on social media before, eventually learning it was a deleted scene from the season one finale “Mad Idolatry.” The scene showed Ed and Kelly monitoring the broadcasts of the planet and seeing a children’s show featuring puppet versions of Kelly and the little girl she healed with her advanced medical technology. The Orville editor Tom Costantino shared the deleted scene on Twitter, with some additional behind-the-scenes photos also being posted by makeup designer Howard Berger and the official Orville Instagram account. Earlier in the week a deleted scene from the season two opener “Ja’loja” was released on social media. Bortus runs into Marcus and his troublemaker friend James as they run down the hallway after hacking a food synthesizer to produce a bottle of vodka for them. LaLaLand Records just released a 2-CD soundtrack for the first season of The Orville, which features music from all twelve of the episodes of season one. The set offers 150 minutes of music. It can be ordered directly from LaLaLand for $21.98. Question: I’m quite interested in seeing how Isaac evolves. Incidentally, is there a meaning behind Isaac’s name? Is it an acronym? Jackson: You’ll find out about his name later this season. Question: In your opinion is Isaac wearing a Kaylon uniform or is what we see his body? Perhaps his body is some type of jumpsuit wrapped around robotic components to protect them from the elements? Question: Any insight into what Isaac’s homeworld will be like? Jackson: Keep watching and you won’t be disappointed. Question: Why doesn’t Isaac just have a built-in weapon instead of using a hand held weapon? Why can’t you stun people using your eyes? Jackson: All will be revealed. The actor also showed his appreciation for Star Trek. Question: What’s your favorite entry to the Star Trek franchise? ​Jackson: TNG cos I grew up with it. Question: How hard did you study Brent Spiner before this role? ​Jackson: The lovely Brent didn’t come into it. 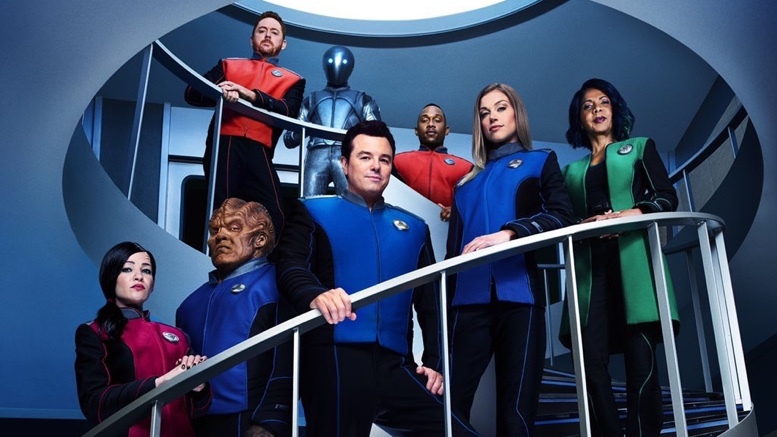 Question: Which actors or actresses from previous Trek shows (that haven’t already had a role) would you like to see appear in future episodes of The Orville? ​Jackson: Did you catch Tig Notaro on Discovery? Loved her performance. She should be on ALL the shows. Last week’s episode ended with a touching scene with Isaac making it rain on the bridge for Claire. Costantino shared a brief video showing how this was done with a green screen to protect the bridge set. He also shared some images of how they shot the shuttlebay scene with the Union Symphony, featuring executive producer and director Jon Cassar. The Orville returns on Thursday, February 14th with the episode, titled “Deflectors.” Check out the trailer below (NOTE: promo says “in two weeks” because it was released on January 31st). I think the good episodes of the show are the best Trek since TOS. However the “rain on the bridge” scene didn’t make much sense. Hardly a logical environmental or even fire-control feature. I figured when they mentioned that the Kaylons would be eventually making a determination on whether to join the Union, that there would be an upcoming episode dealing with just that. Bortus is really my favorite. Mine, too … until mustachioed Bortus came along. Bortus is my favorite too. He is a very likeable and not as simple as he appears to be at first glance. He’s strong, committed, loyal, brave, and very funny. Peter Macon’s delivery and timing when doing humor is great. I bought a “You Will Be SILENT!” Bortus t shirt and it makes me happy. You just like the strong, silent type Marja. Admit it! I, too, miss the jokes. The show just is not all that great without them. Please, Seth & Company…. Bring back the jokes!! I’m in the UK so I haven’t seen the Bortus ‘tache episode yet – but I can’t wait! I’ve been loving this season of he Orville so far. Just got season 1 on DVD and re-watching that, you can really see where they doubled down on what worked and made that the focus for season 2. The comedic elements now seem more organic to the situations (which they mostly were in s1, but it’s less overt in s2), and the character focus on the show is like if TNG had been like it was in s3 from the beginning. I really do look forward to new episodes of the Orville every week! I hope we eventually get rumours of a spinoff (if it’s not on a space station I can live with it – but I’d love to see the expansion of this universe). If by more “organic” you mean they are non-existent, then yes. Wonder why Isaac’s “eyes” are separated further apart in the top pic? I really miss Alara. The new girl is too much like Kelley in her way of talking. Alara was just her own, non stereotyped character. Does anyone agree? Very much so. Alara was an interesting mixture of vulnerability and superhuman strength. Talla is, as you say, Kelly, only without the charisma. I hope she’ll just a placeholder until Halston Sage can return to the series. I agree. Alara was softer and I liked her more. I liked Alara better too. She was what Tilly was supposed to be, I think. But we only had the new one here for the one episode. So I hope she gets better. But, yeah. Ms. Sage was better after one episode. Both good scenes. Wonder why they were cut. The puppets took you out of the hopeless mood of the bridge scene, and the corridor scene makes Bortus look like an idiot for not figuring out the kid is holding a vodka bottle behind his back. Yep. The Orville producers/editors have spoken about the puppet scene, that’s exactly why it was cut. It was cut for not matching the tone of the episode. Macon’s face out of makeup is a big surprise, reminds me of Michael Che’s expression on SNL. Am very glad they are going to get into Isaac’s people this season. Given that there might not be another season, am hoping more sustained depth will somehow translate to ratings, but I’m thinking this is more like a slow-motion FIREFLY, where we will just have to cherish whatever we can get for as short as it lasts. It was a good idea to let us know that there’s explanation about Isaac coming soon. Or is it I.S.A.A.C.? So long as his first name isn’t Isolinear, I’ll probably be good with it. They’re releasing this on blu-ray? Make sure to pick this over Discovery.